The holidays will be here before you know it and so is your end of the year office party. The holidays are a great time when people come together with co-workers and significant others for a once a year event, to experience holiday cheer, socialize, eat and have some flowing adult beverages. However, quite often, people attend just attend another old holiday party, where some attendees would rather be somewhere else. It’s time to make sure your holiday party goes down in the books as “one to remember”, an annual tradition for your business or organization for years to come. Introducing the Casino Holiday Office Party! Wouldn’t it be great to bring your employees an experience like no other holiday party they’ve ever experience before? Well, bring Vegas to them and party the night away as though you were at a real casino! Players use funny money or special, customization playing chips, rather than using real money. Here’s the good news, if attendees need more funny money or playing chips, they simple ask and get to keep on playing throughout the night; how wonderful and fun is that? Below you’ll learn more about the elements that go into having such a unique holiday party that may be perfect for your annual holiday party for years to come! One of the best things to remember when throwing a Casino Office Party is to don’t cut corners. You might think that “average” tables are no big deal to guests, but if they are going to the “casino” they want a quality place to play. So, try to ensure the experience is as real as it would be if they were in Vegas. Key feature, the felt table shouldn’t be torn or show spots/ residue from another party. When the company is unpacking and setting up before your event, usually consisting of 2-4 hours, make sure to double-check the tables before the evening gets going. It’s always beneficial to note any existing damages so your party attendees aren’t to be held responsible at the end of the night. 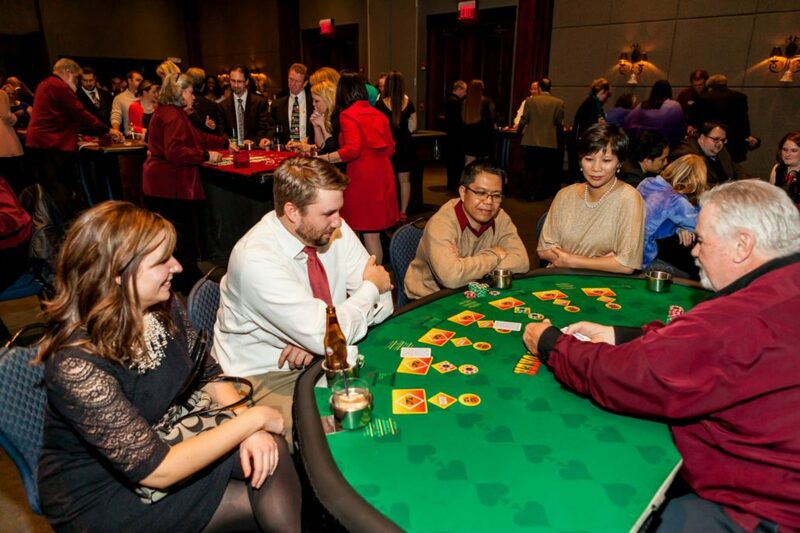 It’s normally a good idea to have a variety of tables whether that includes the popular Blackjack, Craps, Texas Hold ‘Em, or Roulette casino games, so your guests have options of what to play throughout the evening. When deciding on how many tables are appropriate for your event, consider your guest count, as well as if there are other entertainment options throughout the night. You don’t want to have your guests waiting a long time to play because there’s not enough casino game tables. Next, it’s time to make sure that the folks that are going to be your casino dealers for the evening are friendly, experienced and in a nut shell, know what they are doing. Can you imagine going to Vegas and having to grit your teeth while a dealer struggles? Also, it’s essential to have dealers who can teach those who are not familiar with the games as to how to play. Remember, you want people to have fun and not be intimidated because they don’t know how to play certain games. This is why your dealers need to be friendly and put your party attendees at ease. Well, if your party is going to be as realistic as possible, having experienced dealers is a must. So before you book your Casino Party dealers make sure to do your research. Check out reviews of the company, people you intend to use that evening, and look into possible past businesses they have worked with in the past – usually there will be testimonial statements on websites so check that out too! Aim to make your guests feel like they’ve been picked up and transported to Vegas! Start by adding some glitz and glamour to the location of your Casino Party. Start by adding in some extra lighting throughout your space. Throwing in a retro disco ball can add some fun to the night, or strand of lights across the room, etc. Also, consider a red carpet entry and make your guests feel like real VIPs for the evening. After all, this night is all about them having fun! Additionally, consider securing a photo booth for a few hours that evening, as this is a fun way for guests to document the fun with several silly pictures. Lastly, customizing the playing chips for the guests is a great way to add additional decoration for the evening. Plus, your guests can take a few home as a souvenir to remember the evening! In regards to attire, it would be a good idea to list the dress requirements for the evening on the invitation. To tie the evening together, fancy dress wear is a great way to kick up the theme that much more. Your guests will begin to feel like their having a night on the town, and not just at a plain holiday party. Alright, so it’s come down to the end of the evening and it’s time to determine some winners. There are a variety of ways prizes can be awarded at your Casino Party. First, it’s easy to start off by seeing who made the most “play money” with their chips. You can always choose to award first, second, and so on for such a contest, but it is purely up to you. Prizes can include TVs, DVD players, gift cards, etc. Second, raffles are a great way to give prizes out at your Casino Night. Throughout your evening, have one of your party hosts walk around with raffle tickets that your attendees can purchase with cash money they brought with them. So make sure they know ahead of time that this is an option to participate in during the party. Third, there is always an option to do a silent auction at your event. Consider your audience and if you believe this is something that would be entertaining for them. If not, don’t waste time planning a piece that you don’t see major success coming from that evening. Now, these are just a few ideas in regards to prizes for your event, however don’t hesitate to get creative and find other ways to do so. Lastly, consider the ambience during your Casino Party. It’s always great to have some background music playing for a touch of something extra for your night. Check out top DJs in your area and get pricing. It’s always best to consider the company’s reputation, reviews, as well as cost. You want to make sure you are spending a fair amount and not being overcharged for a service. Additionally, make sure the DJ will give you options for how they run the evening. Will they give you an assortment of music genres, take requests, etc. Just know what you are getting before the actual event. All in all, remember it takes careful planning and precise execution to create a great event. Be creative and don’t hesitate to team up with an outside company to help you plan your important holiday event. 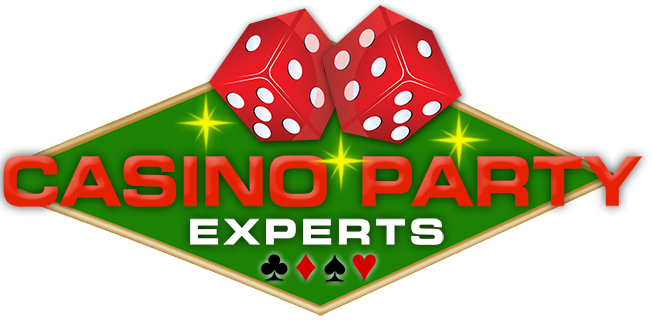 You might be surprised at what you can do when working with the right company, like Casino Party Experts! Here’s to a better and more fun Holiday Office Party this season!